Sunday. My London visit was over. I decided to take a taxi from my friends’ home to Paddington and take the HEX back to Heathrow. I made it to the airport in less than 45 minutes, which is just fantastic in my book. Since I am a Star Alliance whore, I couldn’t go direct to Barcelona, so I flew Lufthansa through Munich. The Munich flight was a nothing to write home about. I sat in an economy exit row seat. We were served a surprisingly tasty pepperoni pizza pocket on the flight, which I paired with a glass of red wine. We left on time and arrived early. The guy who sat next to me was very scared of flying. There is nothing else to talk about on this flight. I didn’t even take a picture. In my next installment I will write about my first visit to the Munich Airport. My next leg took me from Munich to Barcelona. As I was queued up to board through the automated boarding gate, I scanned my boarding pass, a new receipt was kicked out. I was upgraded to business class. This isn’t all that great — business class on intra-Europe flights is just a regular coach seat with the middle seat blocked so no one can sit there. The food and wine is better than what is served in economy though. I was greeted by a lovely and young Lufthansa Stew. I greeted her in German, she responded in German as well. The entire flight I communicated with the Stew in German — and had no issues with service. Looks like 2 years of College German paid off. My row was completely empty. Newspapers were distributed and I asked for a French language paper and was given El Pais — a Spanish language paper. Oh well. The ladies behind me were Spanish and they asked for a Spanish language newspaper, in Spanish…then in English once…the Stew didn’t understand. They didn’t have any more. I decided to offer my paper to the woman behind me. I spoke Spanish to her, which I think she appreciated. It took some convincing, but she took the paper. 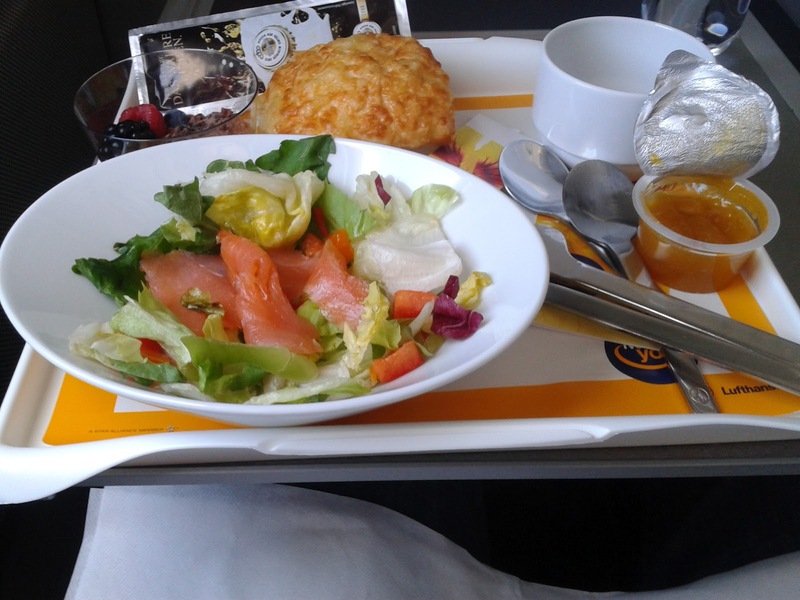 I love that European carriers serve food on all flights – and truly real meals in Business Class. The lunch that was served was a Fresh Dandelion Salad with Strips of Smoked Salmon and a Cranberry Dressing — at least according to the menu. The dressing I was given was a mango chutney, which was really great. Not a big smoked salmon guy, but I did try it. Salmon is just a bit too oily for my liking. I love the German language. 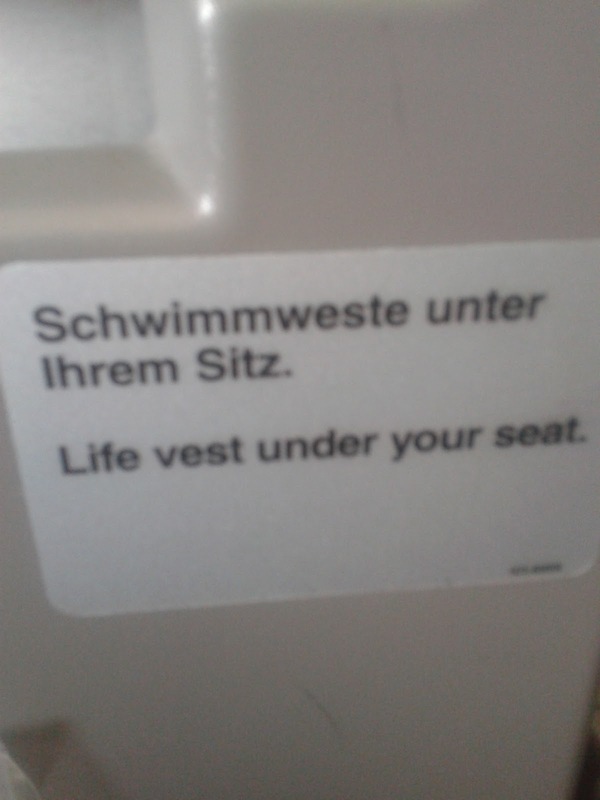 Life Vest = Schwimmweste. Makes perfect sense, doesn’t it? 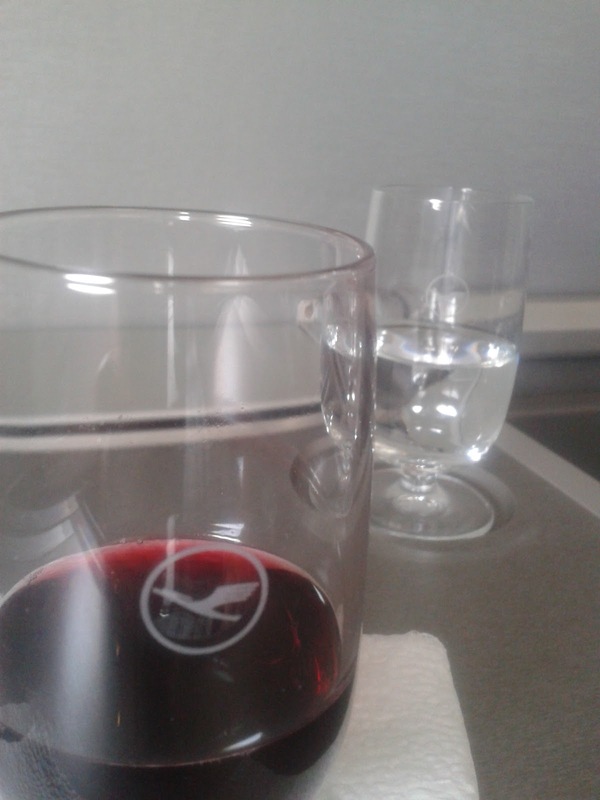 I enjoyed a few classes (well…maybe a full bottle) of red wine on this flight. I really dig the Lufthansa bird logo, don’t you? The flight attendants were very good. I really appreciate how they didn’t immediately switch over to English when I started speaking. I must admit, my brain was a bit fried on this flight. Trying to turn off my English language brain and turn on my German brain for a couple flights, then my Spanish brain upon arrival (or during my limited communication with other passengers). Smoke almost came billowing out of my ears. 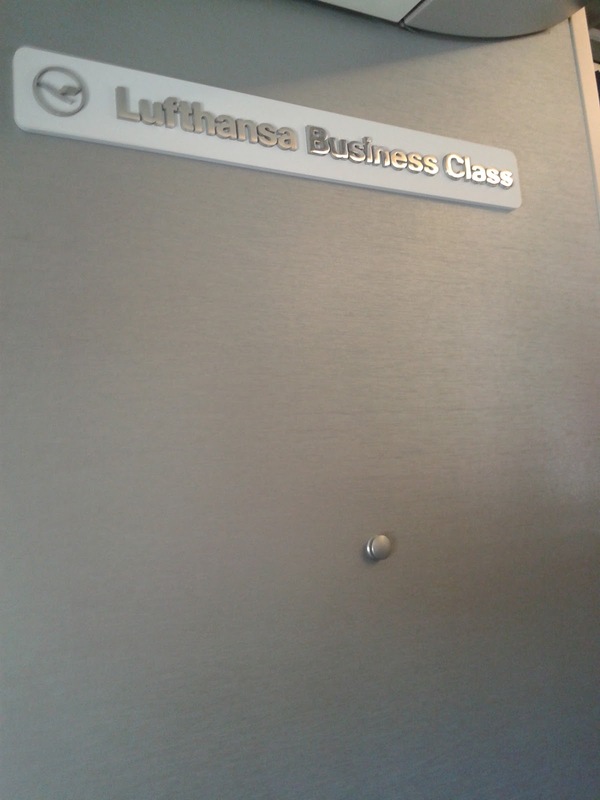 Given a choice I would prefer to fly Business Class inside Europe, but I would never pay more for it, that’s for sure. These set of flights were nice and were more comfortable than domestic US travel and the service was head and shoulders above US carriers. What is your favorite European Air Carrier? Do you buy up to Business Class or do you just hope for a complimentary upgrade? Does your mind ever freeze when you try to move between the different languages you’ve studied? By Tim in Travel on October 4, 2012 .